Bringing together a group of talented, energetic, dedicated research scientists and university students willing to accept the challenge of working in a remote area, the formation of TEAM BUFO has generated an enormous increase in our understanding of cane toads and their impacts on biodiversity. The team has changed in composition over the years, and it’s easiest (though a bit artificial) to separate its history into two parts. The first five or six years were supported under Rick’s Federation Fellowship from the Australian Research Council. Nobody really understood very much about cane toad impacts or biology in the Northern Territory, so the research was very broad. We learnt a lot, and when Rick was lucky enough to be awarded another fellowship (this time a Laureate Fellowship, again from the ARC), we took a more focused approach. These days we are mostly looking at the rapid evolutionary changes in toads and their predators. But in this part of the website, we’ll briefly review the people and highlights of the first generation of Northern Territory cane toad researchers. Some of them are still part of TEAM BUFO, and others have moved on – although in many cases we still work closely with them. Some members of TEAM BUFO at our field station, Middle Point, N.T. Funding from the Australian Research Council allowed Rick to bring Dr Greg Brown from Canada to Fogg Dam to carry out research on snakes. Greg settled in, and was already an expert on the ecology of the local area before the first toads poked their heads over the horizon. Greg expanded his work to study the toads, mostly by radio-tracking. He surveys roads in the area every evening, so was able to capture the very first toads to arrive, and strap miniature radio-transmitters to them on waist-belts. Ten years and tens of thousands of toads later, Greg is now the acknowledged authority on field biology of invasion-front toads. He has also developed new laboratory-based methods to study the immune systems of toads. 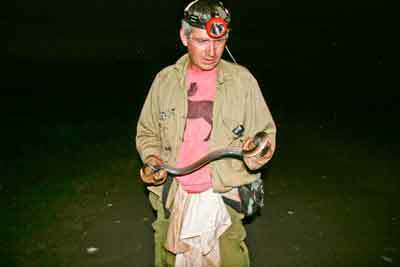 Dr. Greg Brown holding a Slatey-grey Snake on the Fogg Dam wall. had already done his Ph.D on "adaptations of the Queensland reptile fauna to cane toads", so he came to Fogg Dam to base his studies there. Ben started out working on how local snakes deal with these invasive amphibians, but increasingly his work has shifted to look at the toads themselves, and especially how they have been changed by the process of invasion.Ben is now based at Melbourne University, and toads are not his only focus - but we are still working together. 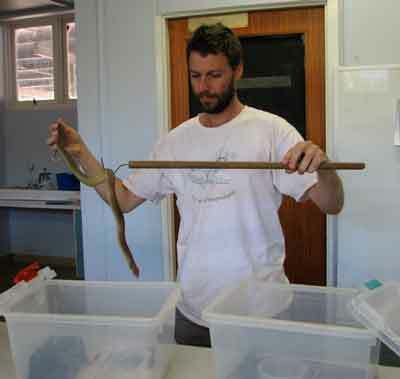 Dr. Ben Phillips with a King Brown Snake in the lab. Like Ben and Greg, Dr. Jonno Webb evolved from a research emphasis on snakes to one that included toads also - in Jonno's case, the interaction between toads and native mammals. 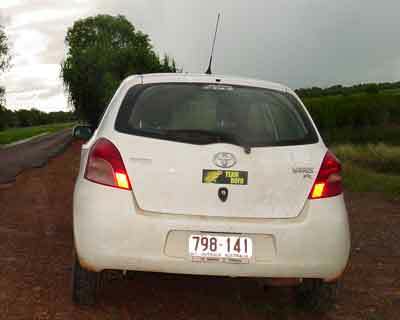 With further ARC support, the group expanded to include Dr Ligia Pizzatto, who came from Brazil to help us explore the effects of parasites on toads, and Dr Jason Kolbe, who came from the USA to try to work out why the toads' southern front (in New South Wales) is moving so much more slowly than the northern front. Jonno, Ligia and Jason have got other jobs, but still interact with us a great deal. Another longterm postdoctoral fellow in TEAM BUFO is Dr Michael Crossland. Michael actually has been studying cane toads for longer than any of us, and knows more about them. 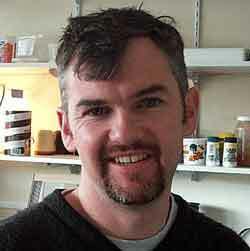 He did his Ph D at James Cook University, supervised by toad expert Professor Ross Alford. Michael's specialty is the ecology of the aquatic stage of the toads - the eggs and tadpoles. He has conducted many experimental studies, and much of his time in recent years was devoted to the pheromone-communication work. Michael was the person who discovered that a chemical in toad eggs attracts cannibalistic toad tadpoles - and the person who ended up identifying the exact nature of that chemical (in collaboration with other members of TEAM BUFO, especially Professor Rob Capon from the University of Queensland). Michael also discovered the tadpole-suppression pheromone that is the focus of a lot of our current work. The other main group in addition to the postdocs comprises the graduate students – people that did their Ph Ds (doctorates) by conducting research. The first group of Ph D students in Team Bufo had a wide range of projects, including frog-toad interactions (Matt Greenlees), bird-toad interactions (Christa Beckmann), lizard-toad interactions (Sam Price-Rees), crocodile-toad interactions (Ruchira Somaweera), toad pheromonal communication systems (Mattias Hagman), and the biology of toad parasites (Crystal Kelehear). In 2009, we were joined by three more Ph D students, to study the toad invasion process (Reid Tingley), toad habitat use (Edna Gonzalez-Hernal) and the ecology of toad tadpoles (Elisa Cabrera-Gusman). All of the students have now finished their Ph Ds and published lots of scientific papers on toad biology. Matt Greenlees has stayed at Sydney University as a postdoctoral fellow to study the invasion of cane toads in New South Wales. On the Queensland coast, John Llewelyn did his Ph.D studies based at James Cook University (JCU, in Townsville) to work out how frog-eating predators manage to coexist with the toxic toads. And we also have worked collaboratively with colleagues from other universities - like Professors Ross Alford and Lin Schwarzkopf at JCU, Dave Skelly at Yale University (USA), and Mark Urban at The Center for Ecological Analysis and Synthesis in Santa Barbara (USA). Another critical collaboration started very early in TEAM BUFO's history, with Dr Cathy Shilton from the Northern Territory government's Berrimah laboratories. Cathy is a veterinary pathologist, and has been a vital source of expertise in answering many questions that have arisen during our studies. And she's also made major discoveries of her own, notably the spinal arthritis in toads at the invasion front, and the role of bacteria in that syndrome. 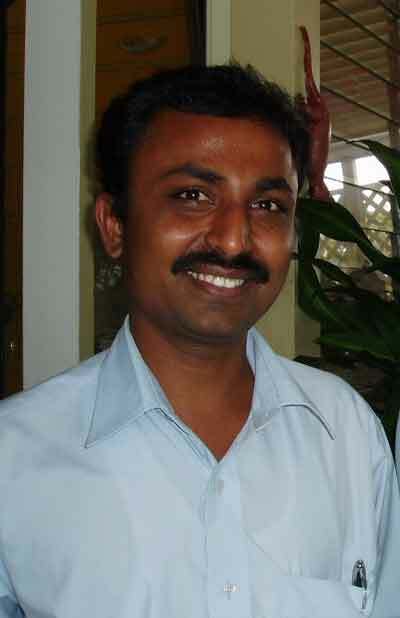 More recently, Dr Raju Radder from India added to the international nature of Team Bufo, and also added considerably to our collective ability to play cricket. Unfortunately, that input was tragically cut short in 2008, when Raju suffered a fatal heart attack while visiting his parents in India. He was 38 years old. Another important group within Team Bufo has been the Honours students – fourth-year undergraduate researchers. Each project only lasts a year, unlike the three years for Ph D students. The first Honours group came up to Fogg Dam in 2006, to study sexual interactions in toads (Haley Bowcock), the distribution of metamorph toads (Travis Child) and the effects of lung parasites on young toads (Crystal Kelehear). The following year, David Nelson joined us to look at how predators learn to deal with toads, and then Georgia Ward-Fear conducted research on whether meat ants might help to reduce toad numbers. Stephanie O’Donnell taught captive northern quolls to avoid cane toads, and then released these marsupials to see if her training helped the quolls to survive (it did!). And Dave Llewelyn came to Fogg Dam to explore the idea that toads at the invasion front have less effective immune systems than do the toads further back in the Australian range. If that’s true (and the evidence says that it is), we might be able to find real weaknesses in the invasion-front toads that would allow us to control their numbers. Iris Bleach examined the effects of cane toads on the behaviour of native frogs - including their selection of shelter sites (do frogs move away if a toad moves in?) and the calling behaviour of males (do male frogs change their calls if a toad chorus starts up nearby?). 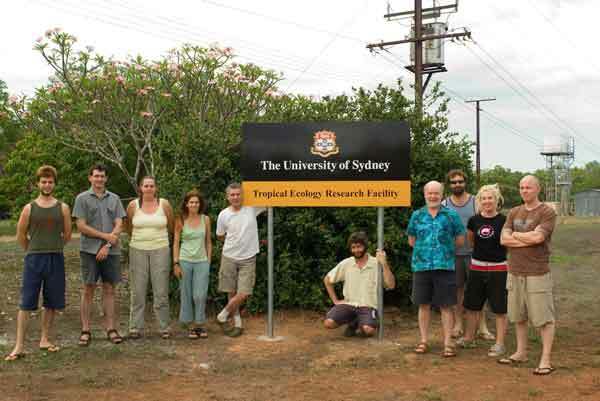 For more information about these scientists, see Rick's "official" University of Sydney website. And in NSW, Sam McCann radio-tracked toads in the Border Ranges to work out just how this giant rainforest frog can function so well at low temperatures. Damian Lettoof looked at whether or not toads affect parasitism in native frogs in the same region (they do – but to our astonishment, they reduce not increase numbers of frogs parasites). And in 2013, Chris Jolly became our third “NSW toad” Honours student, looking at the impact of toads on goannas. Greg Clarke and Felicity Nelson traveled up to Fogg Dam. Greg looked at the tadpole suppression pheromone, whereas Felicity cleared up some mysteries about the parasites in frogs and toads. In 2014, Damian Holden also headed off to the Northern Territory, to investigate the immune system functioning of cane toads. And throughout the entire evolution of Team Bufo, Melanie Elphick has played a central role in organising everybody, and making sure that things happen as they should. Adele Haythornthwaite and Chalene Bezzina (in Sydney) and Michelle Franklin and Nilu Somaweera and Christine LeRoux (at Fogg Dam) joined the administrative and technical side. 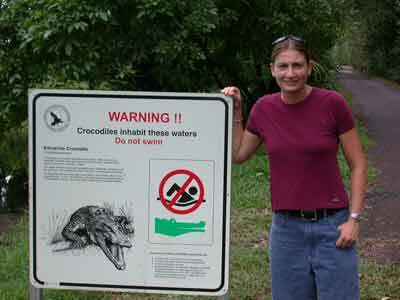 Melanie Elphick, a founding member of TEAM BUFO. 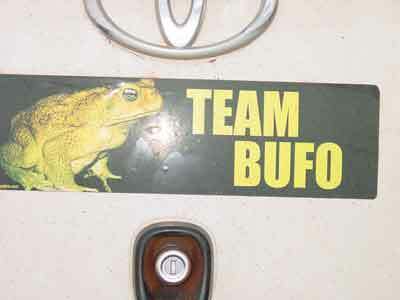 One of TEAM BUFO's field vehicles, Fogg Dam, N.T. In a remarkably short period of time, we had created a major group, with a wide range of techniques and expertise available – so the research really took off. The first generation of researchers created a solid platform of knowledge, that has set the scene for the next generation of TEAM BUFO to build upon. One of our main aims with this website is to provide reliable evidence about cane toads in Australia, backed up by scientific research. We haven't put lots of details about that evidence on the main pages, but it's easy for you to get to it. If you want to explore a topic in more depth, just click on Rick's "official" University of Sydney website. Information posted on this site is intended for educational and information purposes only. Copyright 2011-2012 canetoadsinoz.com All rights reserved.